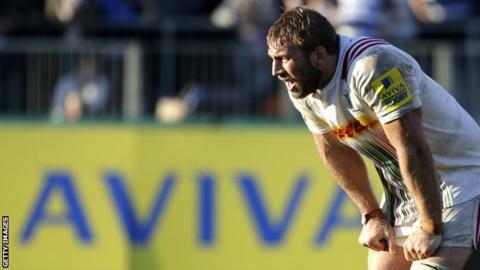 The criticism directed at England captain Chris Robshaw since the World Cup has been "completely unwarranted", says his club boss Conor O'Shea. Robshaw, 29, made his first appearance of the season for Harlequins on Saturday, having been given an extended break after England's pool-stage exit. The flanker turned down the chance to kick a late penalty for goal in the 28-25 World Cup loss to Wales. "I feel for him," said O'Shea after his side's 38-28 win at Bath. "But that's the world you live in if you stick your head above the parapet as England captain," he added. Following the defeat by Wales, Robshaw was then exposed at the breakdown by Wallabies back-row pair Michael Hooper and David Pocock in their 33-13 defeat by Australia a week later. Robshaw first captained his country in January 2012, and has led them to impressive victories over world champions New Zealand and runners-up Australia since then. "He is an unbelievable rugby player," said O'Shea. "He will prove himself again as the best back row in England, I have no doubt about that. "I thought he really grew into the game against Bath. He was blowing a bit but he was outstanding. "Whether people want to make him captain or not, I don't care."